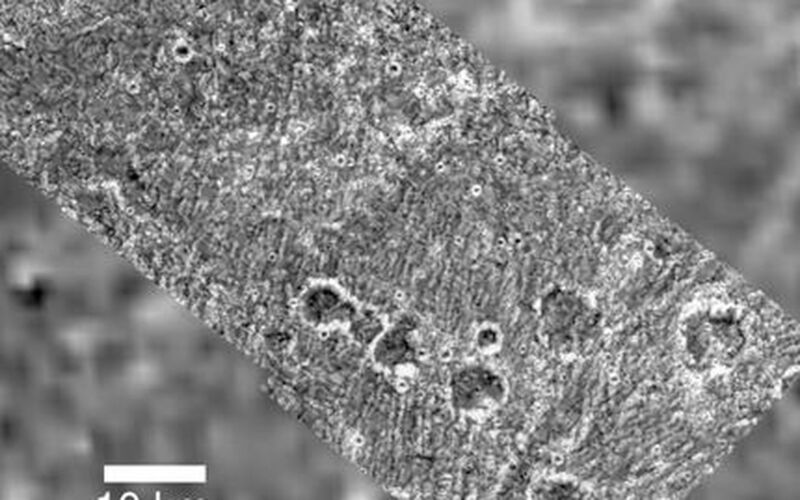 This region of grooved terrain on Jupiter's moon Ganymede has been partially covered by ejecta from an ancient impact structure known as a palimpsest. Palimpsests are circular, bright, low relief features formed long ago by impacts into Ganymede's surface when this surface behaved differently than it does today. This composite of three images was obtained by the solid state imaging (CCD) system aboard NASA's Galileo spacecraft on 6 September, 1996 (Universal Time) at a resolution of 88 meters per picture element (pixel). A lower resolution Voyager image of the same area is in the background. North is to the top. 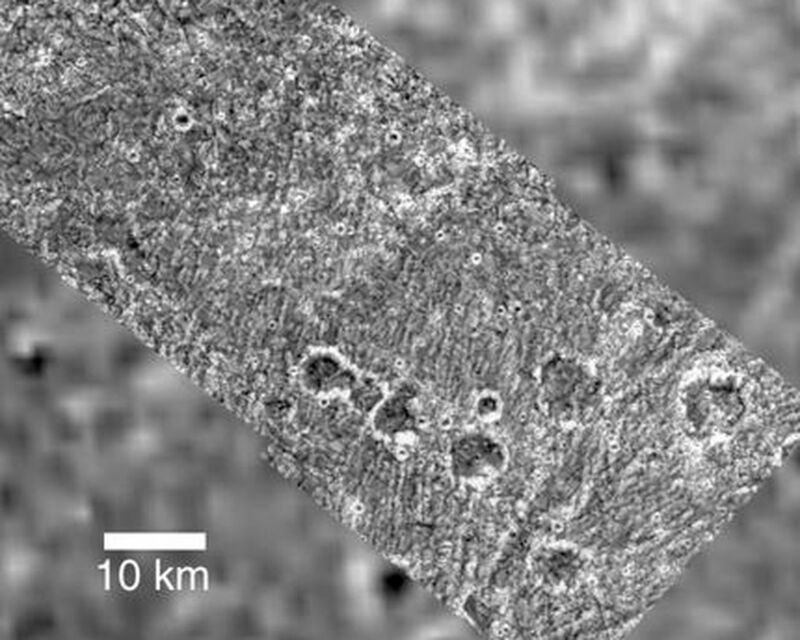 Part of this 350 kilometer (km) diameter unnamed palimpsest is visible as only a slight brightening of the surface in the upper left half of this image. The edge of the palimpsest crosses this picture from lower left to upper right. Secondary craters 5 to 7 km across produced during the palimpsest-forming impact are visible outside the palimpsest, in the lower right half of the picture. Inside the palimpsest, short northwest-southeast trending chains of similar sized craters can be discerned but with much more difficulty, as these craters inside the palimpsest are buried by ejecta. 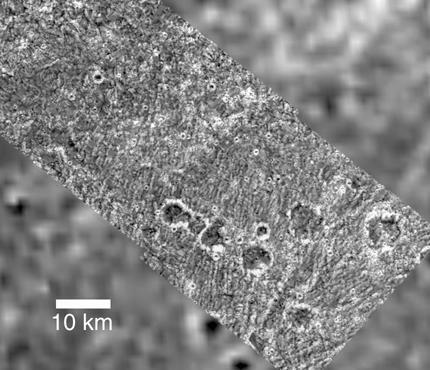 Similarly, the southwest-northeast trending grooves seen clearly outside the palimpsest can be seen with difficulty for a short distance within the palimpsest, where they have been covered by ejecta. This shows that the edge of the palimpsest is the edge of an ejecta blanket. Lower resolution images from the NASA's Voyager mission in 1979 revealed the palimpsests on Ganymede, but did not provide enough detail to allow them to be understood completely. 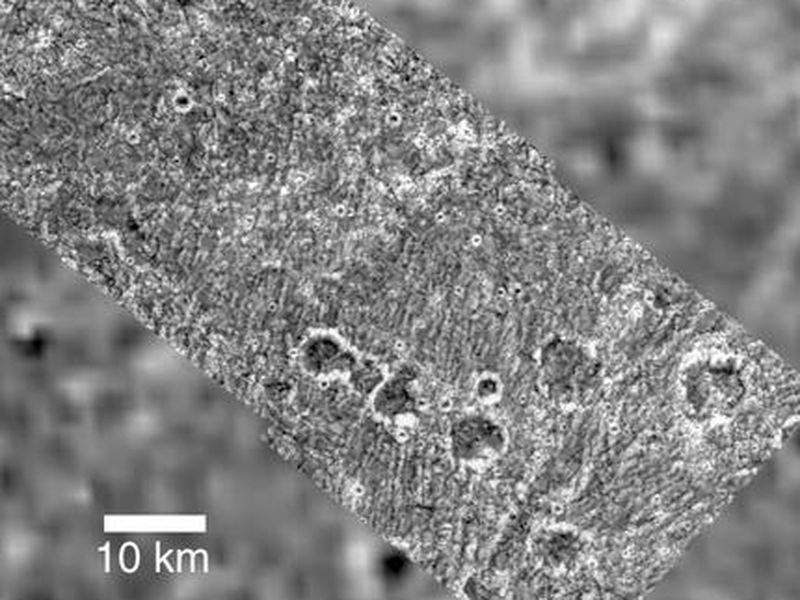 Galileo images of this and several other palimpsests on Ganymede are used in conjunction with the Voyager images to provide a more complete understanding of just how these structures formed.